That's not even the first reassurance shield on I-84 WB from I-90; the first one is about 100' east of the above. 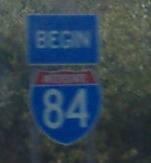 At the merge from Exit 2, the merge gores on I-84 in MA remain unpaved to this very day. These are westbound. All the eastbound green signs that are fit to print. Notice the black borders around all the US 20 shields, NJ-style. Also note that the exit is 3 AB, not 3 A-B, not 3A-B, not 3AB, not even 3A-3B. And it's 1MILE away. 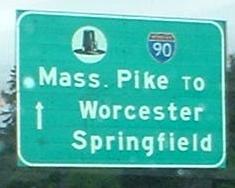 The advance Masspike signage is a little messy (the I-90 shield and the arrow are mini-sized, and the TO looks out of place with the mixed-case lettering). The I-90 pull-through at Exit 3A is probably the oldest sign on I-84 (a tie with the WB pull-throughs), and the ENDS sign is probably the newest - it's on wooden supports that certainly look temporary, so maybe it's gone or remounted by now. Out of blue signs, eh? In 1976, Massachusetts had a lot more button copy. Courtesy Michael Summa, past the tolls. 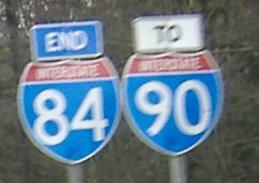 MA 128 was still not yet signed as I-95 then, as there was still hope of completing the route through Boston. 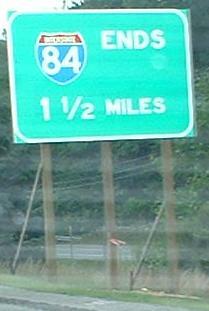 Just as on the EB side, NJDOT invades the WB signage. Heading west from I-90, those last signs are the first overhead reassurances that you're on I-84 - there are a couple of ground-mounted shields, though.